William Beattie Brown (1831-1909) was a prolific landscape painter. Based in Edinburgh, most of his early work was of Edinburgh and the Borders. However, he was increasingly attracted to the wild and remote parts of Scotland, his main themes were Scottish highland landscapes. He was a pioneer among the Scottish ‘out-of-door’ artists, frequently completing his pictures directly from nature a practice which explains his vigour and realism. In 1871 he was elected an associate of the Royal Scottish Academy, and in 1884 an academician. His diploma picture, dated 1883, is a characteristic highland landscape, ‘Coire-na-Faireamh,’ now in the Scottish National Gallery, Edinburgh. 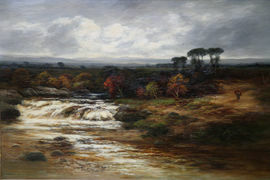 Representative works by him are in the public galleries at Liverpool, Manchester, Oldham, and Bolton. He was a frequent exhibitor at the Royal Academy, London, and also at Glasgow and other Scottish exhibitions.